Brute force attacks are relatively simple for attackers to implement, and bots are one of the easiest ways. Brute force attacks can wreak havoc on your organization if you don’t detect them and shut them down quickly. Join us for a live demo, where we’ll demonstrate a brute force attack (simulated, of course!) 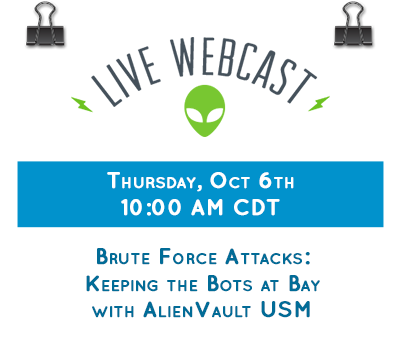 and show how AlienVault USM can help you detect and investigate these types of attacks. Jake is a Sr. Product Marketing Manager at AlienVault, responsible for go-to-market strategy, product messaging and positioning, and sales enablement. Prior to AlienVault, Jake held various Product Marketing and Strategy roles at Symantec Corporation. Jake has an MBA from the University of Texas at Austin and a BA in Business Economics from UCLA. Register for this live event, here.